Zitelli Atlas of Pediatric Physical Diagnosis New Ed! Finishing your Residency in Pediatrics? All you need to do is pass this last hurdle! So, What is a Fool to Study for the Pediatrics Board Exam? There are a number of key things you need to have for the Peds Board exam. First, you'll want to have at least one (preferably 2) good atlases. Reviewing photos will definitely be a help for you on the exam. Typically, the picture book is the 1st book on the 2nd day of the exam. Of course, Atlas of Pediatric Physical Diagnosis would be a great book to use for one of your atlases. Then you'll want a book to cover all the text parts of the exam, this means fairly in-detail sections so you can look up facts and questions you may have. Current Pediatric Diagnosis and Treatment is fairly concise, or you can use your trusty Nelsons. 2 other books you may want to consider include Laughing Your Way to Passing the Pediatrics Board(review of older edition) (new edition here) and Last Minute Pediatrics (if you like charts and tables). 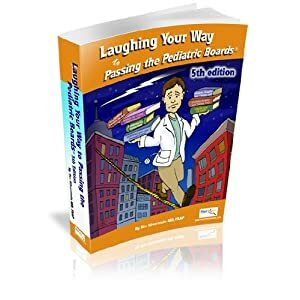 The Laughing books is an annual favorite and about half of Peds boards takers buy this book. It definitely will score you at least a few exam questions, and probably many more. It's an easy read as well! Probably the heaviest sections on the exam tend to be the normal growth and development sections, which expect you to remember at what age kids can draw particular shapes, or when they can stack blocks up to 7 cubes high, and so on. Another popular section every year is infectious diseases. Especially know your arthropod borne diseases. Management of chronic asthma per the NIH guidelines is also tested. If you are superstitious and want to go by historical luck, then check out the Pediatric Board Pass Rates. Good luck! This list indicates relative emphasis of each topic in the examination. Application material for admission to the certifying examination of the ABP may be obtained by contacting the ABP. First-time applicants may complete applications on-line during the registration period for new applicants. Residents in their last year of training will be sent an application through their residency programs in early December. Residents should contact the ABP office if the application is not received by December 20. It is the applicant's responsibility to be aware of and to meet registration deadlines. The certifying examination is given once a year in the fall in a number of locations throughout the United States. The dates of examinations and other information may be found on the ABP website. The Certifying Examination in General Pediatrics will be administered over two days. Each day there are 2 sessions, each of 3 hours' duration, with a luncheon break between sessions. The content of the examination for certification is appropriate for the practice of general comprehensive pediatrics. Emphasis is placed on practical aspects; however, good practice is founded on sound scientific knowledge, and the candidate should be prepared to demonstrate an understanding of basic science. The examination consists of multiple-choice questions. Examples of the types of questions to be used are mailed to registered candidates before the administration of the examination. Some questions are included in the examination for experimental purposes only. These questions will not contribute to the score. Each candidate's examination score will be reported to his or her general pediatric program director. Periodically, the ABP conducts research utilizing data it has compiled; the candidate's anonymity is guaranteed in all such cases. Source: American Board of Pediatrics. See ABP website for most official, up to date information. Information provided here only for convenience.